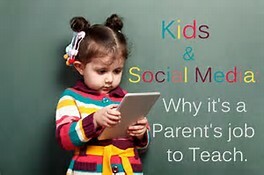 At SuperKids we love social media and the internet because they keep us in touch with one another and with our growing super kids, even after they graduate. We adore following their successes as they grow to celebrate every new event. Our website even has an alumni page where parents can share their kids’ first days of school, holiday pictures and special events. This bonds our community and keeps us together, even as we graduate or move to faraway places. HOWEVER, as a parent my heart sinks a little every time I see elementary-age and younger children with internet and social media sites – or when I see adult sites that mock our children by posting pictures which shed them in negative, albeit sometimes humorous, light. At SuperKids we feel it is our duty to instill in our children a sense of accomplishment and pride in the things that they do. Growing up and tackling new hurdles every day is very hard work. Imagine an adult equivalent to potty training! This is a physical, emotional and certainly maturing stage for every child. Likewise, moving from crib to bed, getting rid of the bottle, to say nothing of learning to walk, run and speak articulately. All of these things usually happen in less time than it takes to get a college degree. It is no wonder young children have break downs or act up. They are on overload! Imagine if adults had to master so many monumental tasks in such a short time? Now think of how many websites you have seen that show pictures and clips of their children acting out. On the one hand, it certainly puts parents at ease in knowing that they are not alone in tackling these parenting dilemmas, but on the other hand I feel that sometimes parents forget that the internet is FOREVER. Just google the names of friends and family – especially teenagers – and see what comes up. Every picture they have been named and tagged in can show up as an internet image. This is their permanent legacy which will be memorialized forever, whether they like it or not. By no means do I pat myself on the back with claims of being the model of parenting, but I can say from the experience of being an overly cautious internet mother, that my children will be able to create their own permanent record when they are old enough. I have two daughters; one is almost 18 years old and the other is 9. My 9 year old asked me this weekend if she could have an instagram account because all her friends have one and she wants to follow them. It brought back all the memories of tackling this issue as I did with my older daughter like a cold slap in the face. Facebook became all the rage when my oldest was in 6th grade. All of her friends were getting an account. Surprisingly some had pages that their parents couldn’t view much less govern. Saying I was labeled the “worst mother in the world” for not letting her have one is an understatement. Not only was my daughter furious at me 50% of the time, but other parents and adults were also very critical that I was “holding her back” and not letting her be a “normal teenager”. Obviously every household and every child is different, and what works for one family or child might not be the answer for another. Regardless, I will give you my personal opinion and the reasoning I have spewed many times to all of my critics. First, social media consumes a tremendous amount of time. We are living in an age of over-scheduling our children. Many children start competitive sports and activities even as early as first grade. They bounce from school to one activity and then another all day, and even on weekends. Our children’s time has become preciously scheduled and often in lieu of our family time. This situation has made our children ripe for social media interaction as the small sound bytes of instagram etc. keep them caught up quickly. However, the ramifications of constantly receiving information in this manner has resulted in a generation of children who have a hard time concentrating for longer lengths of time, and whose ability to relax is limited by a barrage of external interruptions. Ironically, children can scan through their phones for hours on end, flipping through quick clips of information, but become uncomfortable studying their school work for the same amount of time at large. As a parent it comes down to two things: actively prioritizing what is most important for your children and imprinting in them the ability and habit of concentration. For example, If school is most important to you as a parent, then you need to make sure that you’ve helped your children schedule themselves so that school work has the lion’s share of their time. Second, social media does not condone the values I wish to instill in my children. I want my children to learn that success, fame, and even fortune come from substance and hard work. I call the demise of our children’s generation the Kardashian effect. Our children are being bombarded with materialistic icons who applaud such trivial matters as incessant selfies. Teenagers think that mirroring this type of behavior gains them success, while they find it more difficult to see the benefits of going to college, studying hard, or to being more cerebral human beings in general. We know so much about what media icons are wearing and which parties they go to, yet nothing about where they went to school or how well they did there. Our children are being taught short-term success lessons for life and to trust the opinions and thoughts of people without knowing anything about them – so much so that I surmise, if Brad Pitt ran for president, his chances of winning would be strong, purely based on his celebrity. Sadly, what our children are missing from the glitz and delivery of many celebrities’ success is that undeniably they do work very hard. I prefer my children obtain their own fame from hard work, dedication and the innate abilities they can bring to the table to make themselves and the world around them better. Finally, and most importantly, while I believe that every child is entitled to makes mistakes in life, I do not believe that those mistakes should define them. It is a very rare person who can claim a flawless life devoid of bad judgment through puberty. Mistakes can be as simple as wearing a horrific outfit or even as bad as drinking your first beer too young. While I do everything in my power to stay active in my children’s lives and help counsel toward good decisions, the fact remains that growing up means going through many different stages, experiments, and learning experiences. Some they will be proud of, and some they certainly might want to forget. Regardless, I want my children to have safeguard over their mistakes and over the information that defines them later in life. After all, most mistakes will be the learning experiences that help shape future successful outcomes. When my children apply to colleges or jobs, I want them to recognize their moments of growth and define themselves by these successes, instead of being defined by a bad day that lives on in the internet databases. As a parent every stage comes with it’s challenges. I must say, getting my oldest daughter off the binky still tops my charts. The best lesson I have learned is that we can get through any concern if we employ consistency. Whether a challenge involves getting rid of the bottles, potty training, or school work, the message has to be consistent. Social media is no different. I don’t post family pictures without asking their consent and we discuss why it is “approved”. My goal is to teach my daughters the life lessons of protecting themselves and their privacy and to help them understand that their pictures and words are not only powerful but last forever. There is a developmentally appropriate time and place for everything in our children’s lives. It is up to each parent to determine when that is for the best safety and health of their child. I believe if you asked my daughter today, as a young adult, if it was so horrible not to have Facebook she would say, “no”. At our house we started with instagram, moved to twitter and at almost 18 she finally opened a facebook account because it became more of a necessity than a hobby because college communities use it communicate, look for roommates etc. Oh brother…yet another stage of parent education for me!